Planning a family cruise? Good call! A cruise is a great way to vacation with a large family. Once you get there, the itinerary, dining and entertainment are all taken care of, so you can just enjoy time with the family. I have taken two cruises to the Bahamas with my entire family in the past year and I hope to do it again because we had such a good time. Here are my tips for cruising with a large family. On the Disney Cruise Line, you can book adjoining rooms that feel like one large room. I originally felt like a Disney Cruise was impossible to afford, let alone two rooms, but as I researched further, I found that there were affordable cruises, even with two rooms, to accommodate our family of six. On another cruise line, I could not get adjoining rooms, but I was able to get two rooms next to each other which was also fine. It’s a lot less stressful to go on vacation when you have less to haul around. Cruise staterooms are small and luggage fees add up fast if you are flying to your port. Warm destinations require less bulky clothing. I have found that kids can wear most outfits twice. Passports are the best documentation for everyone in the family. However, for most cruises, kids can board the ship with a birth certificate only. Check with your cruise line to make sure. I was told I could bring copies of my kids’ birth certificates, but they needed to be a good copy on which the seal was clearly visible. On our most recent cruise, we accidentally trashed our kids birth certificates in the hustle and bustle of our travel to the port and had to have a friend fax new copies to our hotel. They were not very good copies – for obvious reasons – and the cruise line was hesitant to allow us to board the ship. This was not fun for us and we will spring for passports for future travel. 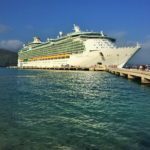 We have taken our kids on two different cruise lines, Disney and Royal Caribbean, and were impressed with both kids clubs. They give you security bracelets and have activities for all ages. Some of our kids did not want to participate in the kids club and that was fine with us. Some of our kids wanted to go all the time. Kids clubs are a great option that made our vacation more fun. My least favorite ports are the ones where I don’t make plans. You don’t have to book all of the reservations in advance, but do the research so you know your options. For example, we knew we were going to visit Atlantis on Nassau, Bahamas, but we waited until we got on the ship to book our tickets and ended up saving money. However, another excursion we wanted to do got canceled because not enough people (including us) signed up in advance and we had to get creative and make our own excursion. On the first day of the cruise, we take a tour of the ship to familiarize ourselves with the layout and room location in relation to the dining room and auditorium. It’s hard to get lost because there’s no getting off the boat. We felt comfortable allowing our older kids to come and go as needed. Because you may not have have the use of your cell phones on a cruise, communication and planning become more important. We stayed together most of the time for simplicity. It can be easier to work in alone time on a cruise ship than on other types of vacations. On one cruise line, we had two rooms next door to each other, but they did not adjoin. Our children were old enough to stay in one room and my husband and I were in the other room. It gave us time in the evenings to watch a movie or enjoy down time while the kids watched cartoons and laughed with each other next door. A friend with older kids told me how she and her husband put their kids to bed each night with cookies and milk from room service and then went dancing or to evening shows as a couple. The kids club offers late night babysitting for families with younger children. On a cruise ship, there are several choices for dining. The buffet is almost always open. Additionally, there is an ice cream cone machine and other snack bars available on the swimming deck. On most ships, there are also assigned dining times in the restaurant for dinner. The restaurant is open in the morning for breakfast during specified hours and there’s also room service – all included in the fare of the cruise. We found that we were happiest eating at the buffet for breakfast and lunch and then in the dining room for dinner. The buffet is more relaxed and you can eat as much as you want without waiting to be served. At peak times it was crowded, but we were always able to find a table with a little searching and patience. In the restaurant, our only challenge was that the food was a little less kid-friendly. Of course, the Disney Cruise Line provides chicken nuggets and ketchup in Mickey Mouse form every night if desired, but the other cruise lines serve their regular menu for all ages. Our children found it a little intimidating to try new dishes, but they managed. As a parent, I liked exposing them to new things. On many cruise lines, you will need to dine at the same time every night in the restaurant, and choose the time in advance. I like the earlier dining time but I have friends who prefer late dining. Late dining is less popular so sometimes cruise lines will offer incentives to encourage people to choose that time. Consider your evening entertainment options and bedtimes and then choose the time that works best for your family. Hopefully, these tips will help you plan a wonderful and memorable family cruise. Have you cruised with a family? If so, please share your tips and experience in the comments below! I’d like to know how you get a good deal on Disney cruises. They are so expensive for this family of 5! That’s a great question! Disney cruises are more expensive than most other family cruises because they are in high demand and they offer that special Disney magic. You probably will not ever find deep discounts on a Disney cruise, but you may find better pricing if you book well in advance and look at shorter itineraries at times when fewer families are cruising, like January. I would also call Get Away Today. They can book any cruise for the lowest available price and give you free personoalized advice on finding the best price on a Disney cruise.